We haven’t even had it for dinner yet but it smells so good, I have to write down this recipe! 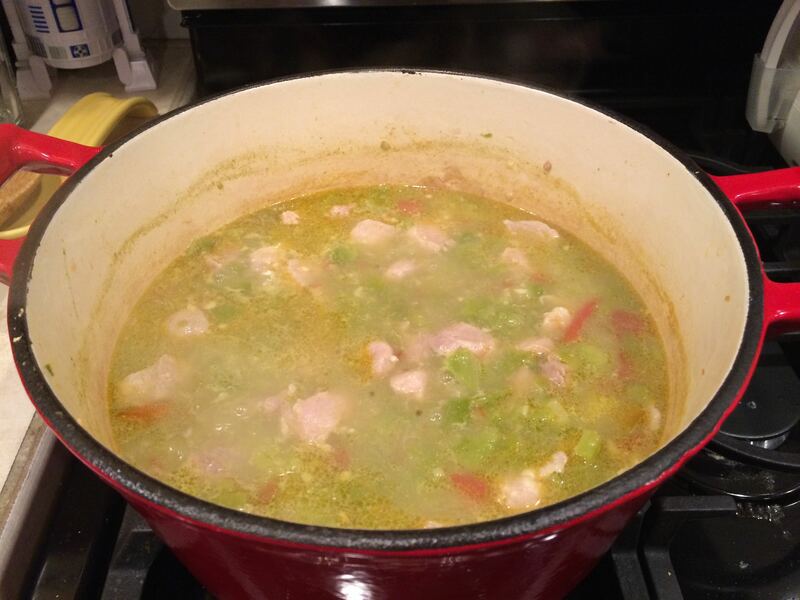 A bit unorthodox for me, but I have some green chile stew simmering on the stove. It’s a new recipe. The house smells SO GOOD, and the tastes I’ve had are SO GOOD, I need to write down this recipe now before I forget. Not only does it mean I get to share it with you, but I can also stash this URL in my “Favorite Recipes” folder on my Chrome Bookmarks. Since we moved to Colorado, we’ve been greeted with green chile of all kinds. Most will have heard of the famous “Hatch” chile, which can be only called that if grown in the Hatch Valley of New Mexico. There are festivals celebrating this fruit*, and numerous roadside stands appear throughout Colorado Springs selling freshly roasted Hatch chiles. I found this in my grocery store’s frozen food section. It’s available nationwide, go to http://www.selectnewmexico.com/ to see if it’s available near you. *Indeed, chile peppers are fruit. I was grocery shopping today and I happened across this 1.5 lb. bag of frozen green chiles. When I was looking at the product, debating whether to buy it or not, I saw a recipe for green chile stew with pork on the back of the package. I only needed some pork to complete the ingredients list on the back, so I picked up some stew meat and went home to try it out. This is a very easy, very basic recipe, without the cream-base that many others have. This also seems close to the world-famous Denver Post green chile recipe, which I’ve also tried. Here’s my version of the recipe, adapted from the one on the back of the package of Select New Mexico 24 oz. of green chile peppers (which I can’t find online to save my life!). Heat the olive oil in a heavy medium-sized pot or Dutch oven. Saute the garlic for about one minute, then add the cubed pork. Brown the pork thoroughly. Add the chile, tomato, cornstarch slurry, and chicken broth. Bring to a boil. Turn heat down to simmer for 45-60 minutes. Season. Garnish.